The alpine waterfall flowing down the cliff near Luceram in the Alpes Maritimes in Provence, France in Europe. The alpine waterfall near the village of Luceram in Provence, France is one of the many interesting sights to be seen when hiking through this area of the Alpes-Maritimes. The Grande Randonnee hiking trail crosses through the main street in Luceram and up the hilly village streets. The trail leads over the Col St-Roch at 991 meters and eventually down into the Vesuble valley. There are quite a few good loop hikes from Luceram in Provence, but they can be quite steep, especially the trail close to Mont l'Able (1260 meters) continuing on to Col de l'Able (1148 meters). Hiking is the primary sport in and around Luceram in the summertime and the Maison de Pays (the Tourist office) in the village will provide any information needed. 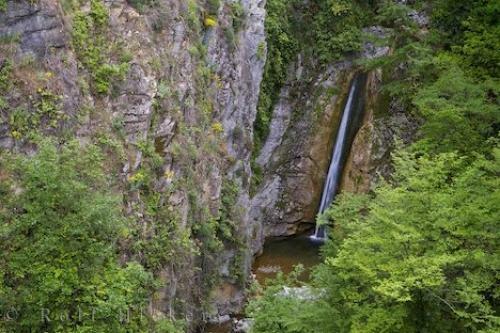 Photo of an alpine waterfall near the village of Luceram in the Alpes Maritimes in Provence, France in Europe. ... The scenes can range from a small child's effort to a detailed, professional creche or a tiny figure in a walnut shell to a 10 meter reproduction of the village. Hiking in summer amongst the rushing sounds of an alpine waterfall or enjoying Christmas scenes in winter, Luceram in the Alpes Maritimes in Provence, France is worth visiting.Waterfall near the Village of Luceram, Alpes Maritimes, Provence, France, Europe. I photographed this photo with the digital SLR camera model Canon EOS-1Ds Mark II, aperture of f/13.0, exposure time of 1/8 sec. on ISO 100, as always I used a original Canon Lens, the focus lenght for this picture was 70mm.